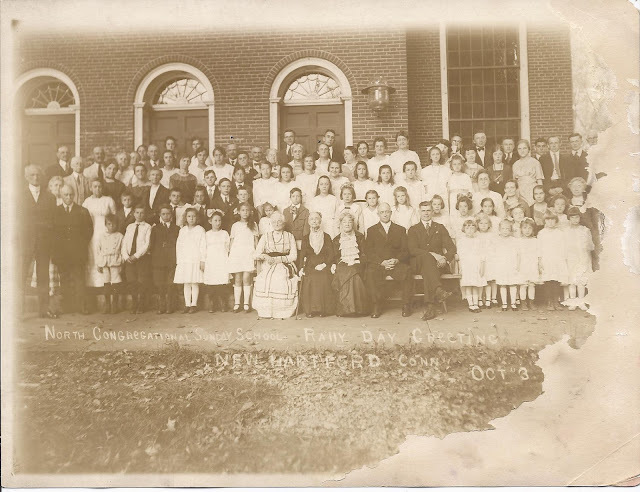 8-1/2" x 6-1/2" damaged group photograph taken at the North Congregational Sunday School Rally Day, at New Hartford, Connecticut. The date, which shows Oct. 3, probably also showed the year, but that section is damaged. Two people in the photograph are identified by means of a dot above their heads: Frank L. Whitney and his wife Minnie Louise Whitney. If you click on the photograph to enlarge it, you'll see the dots. The couple is not standing together. Frank is in the back row, a bit to the left, and Minnie is at the center back with a man standing behind her in the right doorway. Frank L. Whitney was born at Sanford, New York, in July 1861, the son of Francis Samuel Whitney. I found a conflict regarding the identity of his mother. The 1880 Census gives her place of birth as New York. The 1900-1930 Censuses in which Frank was enumerated after his marriage give his mother's place of birth as Canada. Several online trees identify her as Lucina A. (Smith) Whitney, who was born in New York. 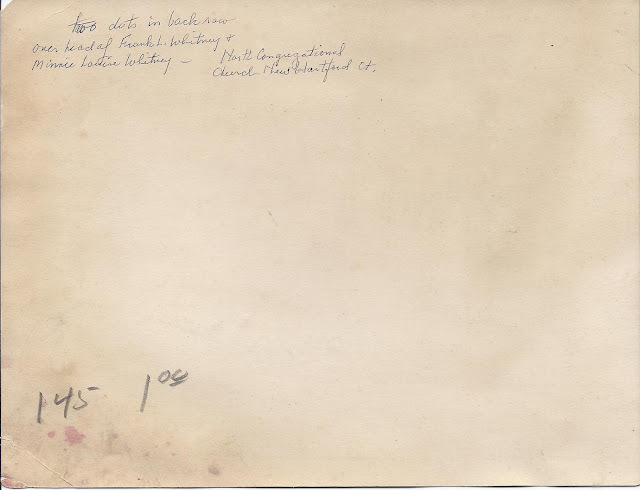 In a closed online listing for a photograph of Frank L. Whitney's house in New Hartford, his mother was named as Abbie (Crofts) Whitney, "according to family genealogy papers". It's possible these were the same two women. Here's a link to that closed listing, which has some information about Frank, Minnie Louise and their son Guy. 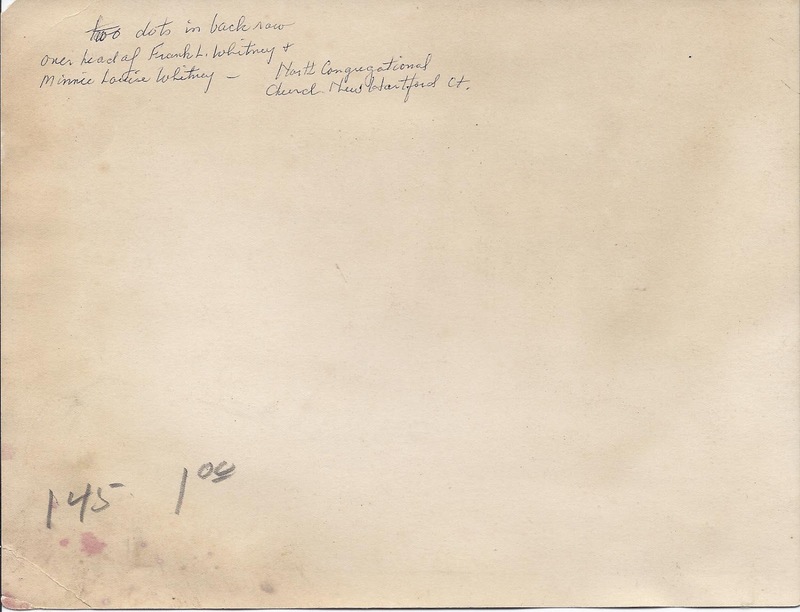 The seller acquired a collection of photographs taken by the Whitney family of houses and scenes around New Hartford, Connecticut. There's a beautiful house shown, but I don't know if it was the Whitney home. Adding to the confusion, I found conflicting online trees for Frank's paternal grandparents. Some trees have them as Benajah and Rosene (David) Whitney. Another had them as Elijah and Polly (Boomhour) Whitney. I believe Frank's maternal grandparents were Samuel Scott Smith and Sally (Vibber) Smith. About 1886, Frank married Minnie Louise. A marriage record for their son Guy Francis Whitney gives her surname as Towslee, but I don't know if that was her maiden name or a previous married name. The 1900 Federal Census finds the couple living at New Hartford, Connecticut, with son Guy F. Frank was working as a Railroad Station Agent. Frank was still working for the railroad at the time of the 1910 and 1920 Censuses of New Hartford. By the time of the 1930 Census of New Hartford, he had retired. I believe Minnie died in Florida in 1939; Frank died about 1940. If you have insight into the families of Frank L. Whitney and his wife Minnie Louise, please leave a comment or contact me directly.